Parents! If schools were meant for learning, why do we have grades? In other words, if learning were the goal, wouldn’t every student have to get an A+ before moving on to the next level? If, when a student gets a D, and it indicates the student met 64% of expectations, is there learning going on at that school? Wouldn’t a 100% grade represent true learning? As long as there are grades less than an A, the point of schools, then, is not learning. Worse, not all grades are equal. Does an A in PE represent learning as much as an A in math? They both count the same towards your GPA and both are required. Clearly, learning is not the only thing being measured here. So, the student got a B- or a C+, or an F. What does that mean, anyway? The F might be a zero –no work was done at all, or maybe it was 59% and just shy of a D. That’s quite a leap, but that F is still an F.
Or, maybe that C+ was because, even though the student aced the tests, he didn’t do any homework and got nailed for it on the overall grade. Ask my son, as that was his strategy for high school. He learned everything asked of him, but he only showed it on tests. He learned, but that’s not what school is about. Well… It worked for him, as he’s a successful musician who dedicates himself to perfecting his craft and learning everything he possibly can about it. What’s going on here is that grades measure lots of things, just not always – or even mostly – learning. A student like my son learned everything required of the test but skipped on the rest of the process required by the teachers. sitting down for long periods of time. Okay, so sometimes students are measured on figuring out math formulas or reading literature. But it seems to me that a student could get a much higher grade in high school doing all the other things than strict “learning” that my son did, by actually learning, and never proving it on tests. School is about figuring out what’s expected and then getting it done, learning or not. My advice to parents, however, is not to get to worked up over a student’s ability to follow process. It doesn’t measure worth, it measures… process. See what inspires your child, encourage it, and then encourage her to engage in grade-accumulation as well as learning. At the A+ Club, we often hear from parents and students that the student got a B-, or whatever, and can’t say why. The teacher didn’t explain it, the student doesn’t understand it, and the parent is helpless to figure out why. I just had a conversation with a very bright student who was disappointed in a B+, as her goal was an A. She says that her grade dropped because of a single quiz — which is possible. I suspect, though, that there was something else that knocked her off, and it was very likely manipulated by the teacher. I’m guessing that as a brilliant thinker, quick learner, and full of impatience with process, that quiz grade was the excuse the teacher needed to reflect an overall B+ — smart, got it down but didn’t do everything I asked. I’m hearing disgust from all the high-minded teachers out there who believe that standards are standards and the grade book speaks for itself. I’m sorry, but that’s impossible. You will always, necessarily, judge kids holistically, no matter how hard you try to be objective. Let’s say a student has an A in homework, which is 25% of the grade, an F on tests, which is another 20% of the grade and a D in quizzes (with corrections) and an A+ in classwork, each 20% of the grade. That adds up to a 77%, or a C+. (Try it here: Mercer Univ Weighted Average Grade Calculator). Assuming there’s no real metric for “participation,” the teacher is justified in assigning this grade based upon pure observation, which will then impact the overall outcome of a C, C+ or a B. Teachers can do the same by tweaking different grades, such as dropping the lowest grade in each category, or whatever. From the grades profile we have created, this student is following teacher process, such as in doing homework, but is not learning what is required of the test. Many teachers would be sympathetic to the process and reward a high participation grade simply because the student ostensibly did what was asked, whether or not any learning was involved. I’m not judging this process. I just want parents and students to be aware of it. So what do your child’s grades actually measure? Other assessments such as research projects and essays yield measurable learning, although, like homework and participation grades, these are process-heavy assessments and do not necessarily reflect learning achievement (“mastery” the educators like to call it). Look over the grade book, speak to the teacher, and discover what, really, is being measured. An A in homework does not mean learning is happening, especially in classes in which the teacher grades for compliance and not accuracy (check it off for having something written on the page — yes, this goes on every day). 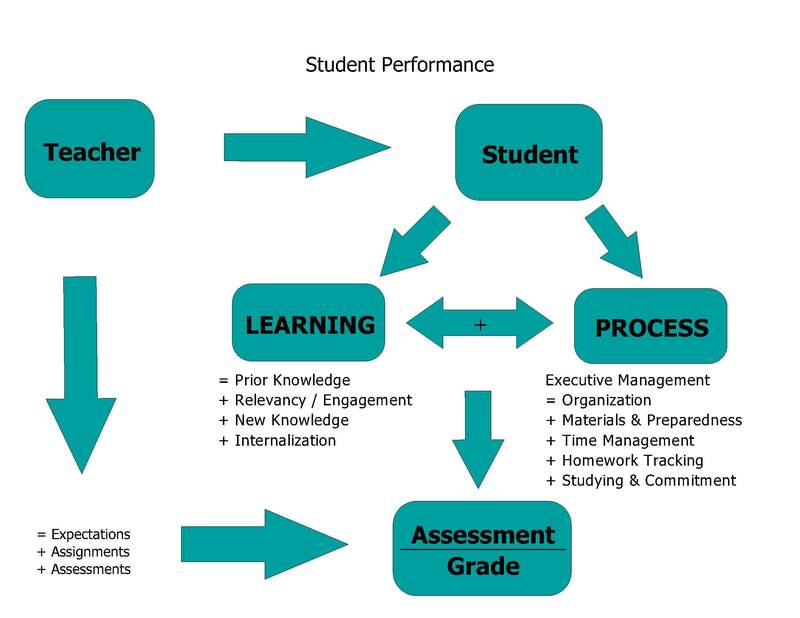 Hopefully the various categories of student measurement align, such as B in Homework, B on classwork, and B on tests. I have to say that a part from A- students, that kind of overall consistency in grade results are rare. Above all, insist upon strong feedback from your child’s teachers. Only the teacher can say what the teacher is measuring, and a good teacher will align grades with thoughtful feedback on actual student production. Grades measure a lot of things. Make sure you and your child understand what, exactly, is going on with your child’s grades. Previous PostTips for Teachers: How to use OneNote for total organization and teacher efficiencyNext PostProcrastinating in class: is classroom behavior a form of procrastination?